The UHD models are increasingly leading role in the market and the large existing catalog comes to add a new member, this time in the segment of the top end. This is the Loewe Bild 7 display, which comes presuming OLED technology. With regard to the design this is a model that follows the guidelines of the brand, with a design to match the other devices of the company. We are facing a screen with a thickness of less than 7 mm and a few nearly invisible bezels only broken by the logo of the brand in the right margin. At the bottom of the screen find the circular button Loewe Eye, typical designs of the brand and following the same sound bar integrated and motorized that is keeps hidden while the TV is off. We are before a model in two sizes, 55 and 65 inch offering a resolution of 3,840 x 2,160 pixels. This model is one of the few on the market that features an OLED panel, so that we are going to find all the benefits associated with this technology. So we will see a greater range of colors and higher contrast with higher brightness and lower power consumption. And all this in an even finer design that allows that if we look at it sideways, for its thinnest part, have an almost imperceptible profile. Further it emphasizes that this is one of the few devices currently on the market that have the Dolby Vision HDR system, while it includes the habitual HDR 10. 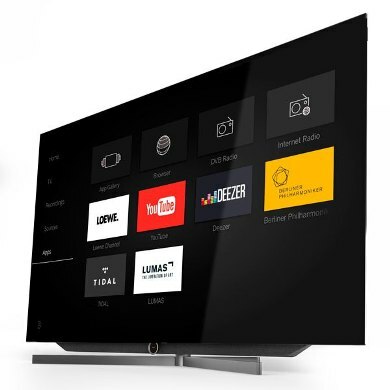 With regard to technologies Loewe Bild 7 includes VantaVision, a proprietary technology of Loewe based on the use of VantaBlack material. A material capable of absorbing up to 99% brightness so that it achieves purer black. With regard to sound the motorized bar that we mentioned before has a 120W power provided by six speakers and four woofers that are hidden inside. A bar that features a ABR (Auxiliary Bass Radiators) design and can combine with home theater systems that enhance Dolby Digital and DTS sound with that account. As for connectivity it features 4 HDMI 2.0 inputs with HDCP 2.2, one Ethernet connection and 3 USB ports, one USB 3.0. Likewise, and hopefully it offers wireless connectivity via Wi-Fi and Bluetooth. In addition and as a complement it includes a DR+ hard disk with a capacity of 1 TB to record even content in UHD to 60Hz. With everything we’ve read the price is clearly not going to be cheap. So if you’re interested you can prepare the Pocket since the 55-inch model will have a price around 5,000 euro, a figure that rises to 7,000 euro in the case of opting for the 65 inch version.